Many of my readers may be wondering where I am? No posts in over two weeks, WTF mate! Well, between travels, graduate school and conferences, life has certainly diminished the brewing operations in my apartment. Not to worry! While the busy times are still here for the month or so, I’m actively getting back into the swing of things. So, in this apartment brewing blog post, I intend to tie up some loose ends and provide some outlook for future posts. As always, cheers and happy brewing! The advanced summer planning for Fall 2014 German Lager worked well as planned (and even jumped the gun a bit). Both the Schwarzbier and Summer Solstice Helles Bock are lagering and ageing nicely. The Helles Bock is spot on, and while the Schwarzbier is very nice, it’s a tad too roasty for style (although no where close to stout levels of roastiness). That said, the little bit of roastiness is quite nice with cooler weather coming into Austin. And the Oktoberfest (pictured above), well that was fantastic! So fantastic that I brought it to the Austin Zealots Summer Picnic, and well, disappeared much sooner than expected. It was quite the hit at the summer meeting, and wouldn’t change the recipe one bit for future re-brews. I recently purchased a wort chiller looking to speed up my chilling times from ~1 hour to near 15 minutes. 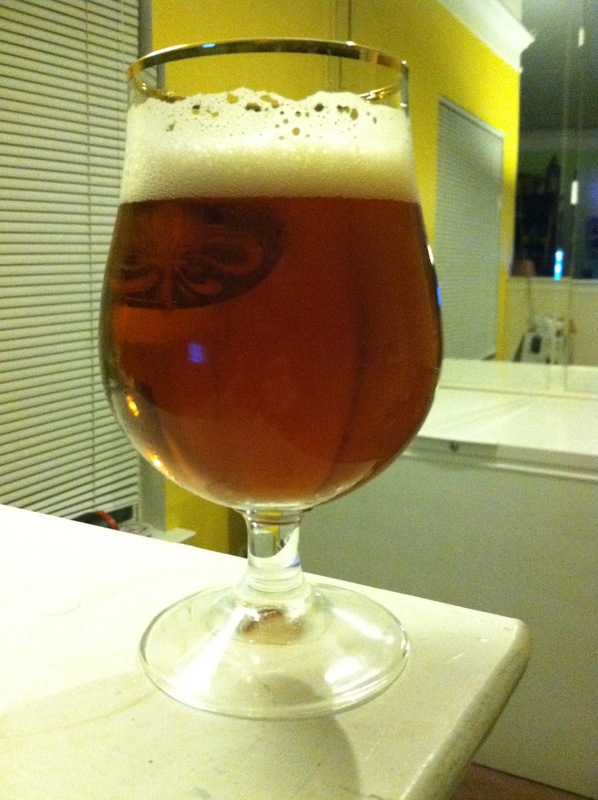 The short of it is that chilling has definitely quickened, and the test batch, a California Common, came out very nice. In fact, I had forgotten it was an extract batch, which goes to show that one can make fantastic beer with extract once you’ve dialled in water chemistry and fermentation. The only flaw I can detect is that the bitterness seems to be a bit low even after correcting for alpha acid changes. I suspect that my quicker chilling times reduced residual isomerization, leaving less-than-expected bitterness. Ultimately, this is a good thing as I’ll be able to leave those nice hops aromas and flavors without converting them to bitterness. Overall, it’s a nice brew, and I’ll modify my bittering additions in the future to reflect the new chilling standards. I hope to turn out some more technical posts in the near term. Reader traffic over the past few months has really focused on the Small Batch Brewing series and Apartment Brewing Tech series. In particular, I plan the finish the lab-grade yeast pitching rate series and continue the essential brewing equipment posts with considerations in brewing materials: plastic versus glass versus stainless. Other than that, I might post a tasting notes, perhaps on my California Common brew, since it has been a great addition to my Fall 2014 beer line-up. How has brewing operations been in your home brewery and have you ever had brewing lulls? Leave your experiences in the comment section below. Cheers, and happy brewing! I always hate it when grad school and the rest of life (well, I suppose that’s just more grad school for me) gets in the way of brewing! I’m also going on my longest brewing drought in a while, but fortunately I still have some aged batches coming due for bottling soon at least. And to be fair, it hasn’t been too long yet. Indeed! Looking to brew a Session Altbier this weekend. Cheers! Life is indeed a constant challenge for beer, for me it isn’t school, just a demanding (and now walking) 8 months old child. I also have a long list of brewing plans for the coming fall, and despite having similar size living (720 sqrft), I can only store one or two 2.5 gallons batches, so brewing is much slower. My main plan for this autumn is to try and make cranberries amber ale for Thanksgiving, as we host the all American event for a few American couples here in London, any ideas how to get that going? The cranberry amber ale sounds like a fantastic idea! A couple of tips in regards to fruit beer and cranberries. First, for any fruit beer, I suggest fermenting the beer without fruit in the primary, then racking the beer onto fruit in the secondary. This helps preserve the aroma of the fruit. Any oxygen incorporation is scrubbed by the yeast during the secondary fermentation. Second, cranberries won’t likely break down during fermentation like typically berries do to their robust outer skin. I would recommend lightly cooking them in some water, just to break them down enough to be pitched. On a side note, you may want to make the base beer a little sweeter than usual since the cranberries can be very tart, but that ultimately depends on how much cranberries you intend to use. Also, if you go on a spiced route, cinnamon often pairs well with cranberries, at least in the ciders I’ve tried. Hope this helps! Cheers! Thanks for the recommendations, I will make sure to only add them on the secondary, sounds very logical. I was thinking to actually use dried cranberries to get more of a sweet finish from them, that way I’ll be able to keep the base beer more neutral.